Acclaimed author and artist Brom raised eyebrows and pulse rates with The Child Thief, his grim, brilliantly audacious, gorgeously illustrated reimagining of the Peter Pan legend. So what does this innovative fantasist do for an encore? He tinkers darkly with the beloved mythology of Santa Claus. Set in Appalachia, Krampus the Yule Lord is a twisted fairytale about a failed West Virginia songwriter who gets ensnared on Christmas Eve in an eternal war between a not-so-saintly Saint Nick and his dark enemy Krampus, aka Black Peter, an ancient trickster demon. Krampus the Yule Lord is Gregory Maguire (Wicked) meets Susanna Clarke (Jonathan Strange & Mr. Norrell) in the realm of Guillermo Del Toro’s Pan’s Labyrinth, as Clive Barker (Mr. B. Gone) works his dark sorcery from the shadows. 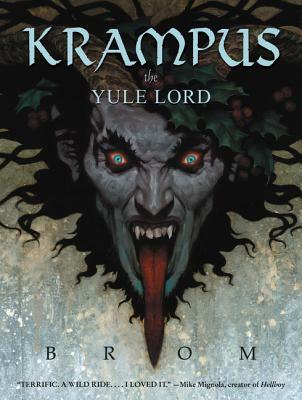 Once again featuring Brom’s chillingly beautiful artwork throughout, Krampus the Yule Lord is a feast of wonder straight from the kitchen of Sweeney Todd.